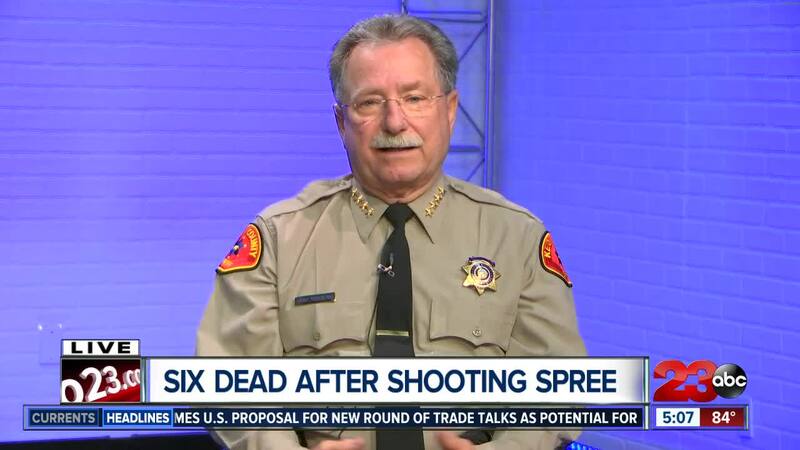 Kern County Sheriff Donny Youngblood drew criticism online after saying this is the "new normal" when addressing the media following the county's single most deadly shooting spree in recent memory. Youngblood clarified the comment during a live interview on 23ABC news at 5p.m, telling our Tim Calahan "what I meant to say is, this world that we live in appears to be upside down," Youngblood explained. "These shootings appear to be normal if you look across our country." The shooting, which happened just after 5:20 p.m. Wednesday evening took the life of six people including the gunman, in what investigators believe is a domestic violence related incident. "It's not something we like, it's not something we accept," Youngblood said. The Sheriff saying in his 40-years in law enforcement he can't recall an investigation that involved so many victims, killed between three different crime scenes. The Kern County sheriff's department released body cam footage from the end of the incident, where the suspect, 54-year old Javier Casarez is seen holding a gun to his chest, before firing the weapon, killing himself. The department posting that video in its entirety on Facebook Thursday afternoon, but by 8:00p.m. that video appeared to be removed from their Facebook account. Earlier in the evening, Youngblood said the department chose to release the body camera footage because "this was such as enormous event, the public had the right to see." Youngblood called it a tough decision, but he said it did not interfere with the department's investigation.